There's a legend in Wagtail about Becca Wraith, whose raven locks tumbled down her back, and whose eyes were said to be bluer than the twilight sky of the harvest moon. In the 1800s, Becca had two suitors, and it didn't end well for either of them. They're said to haunt the abandoned Wagtail Springs Hotel. Loads of people in Wagtail claim to have seen their ghosts. When my cousin Josh and I visited our grandmother, Oma, at the Sugar Maple Inn as kids, Josh was always spooked by the legend. He refused to sleep by himself! But I never believed in ghosts. I'm not sure why. I guess you could call me a "show me" type of person. Wagtail goes all out for Howloween. Skeletons, vampires, mummies, spiders, and witches are just everywhere. There's a hayride through haunted woods, a bonfire, apple bobbing for dogs and people, canine and feline trick-or-treating, ghostly feather agility games for cats, a celebration in the creepy old cemetery, and a costume ball! It's all in good fun, but I can barely keep up with the events. This week, the Sugar Maple Inn is hosting the Apparition Apprehenders, who are here to see Becca's ghost for themselves. They brought along a ghost debunker, whom I like a lot. She's very sensible and grounded. I'm trying not to poo-poo the ghost hunters. We have to be respectful of our guests. Besides, this is the time of year when it's fun to pretend that ghosts and goblins exist. Right? But the ghost hunters are some pretty well-educated guys. I'm surprised that they think ghosts are real. My grandmother and her best friend believe in ghosts, too. They're sharp ladies, which makes me wonder if I'm overlooking something. What do you think? Are ghosts real? Have you seen one? The Ghost and Mrs. Mewer won't be in stores until December 2nd, but I have one advance review copy with an ugly orange cover to give away today. To enter, leave a comment here by midnight October 21st with your email address so I can contact you if you win. Good luck! 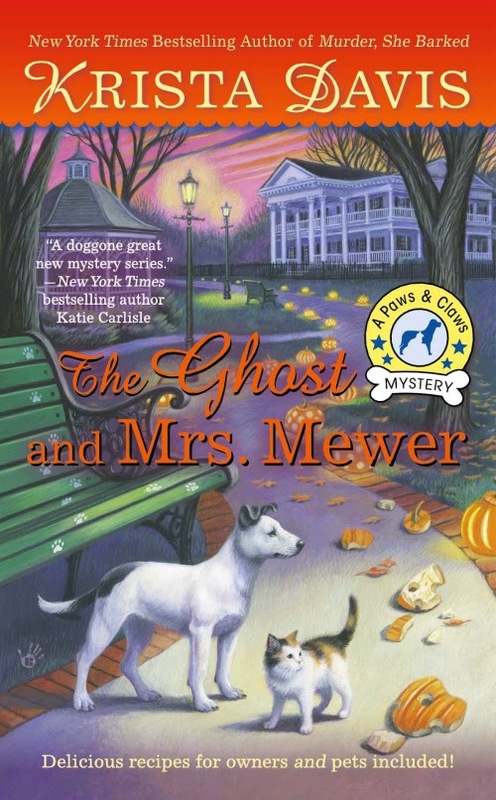 THE GHOST AND MRS. MEWER - coming December 2nd. I love the title of this book, and I would love to read this book—thanks for the opportunity to win a copy! 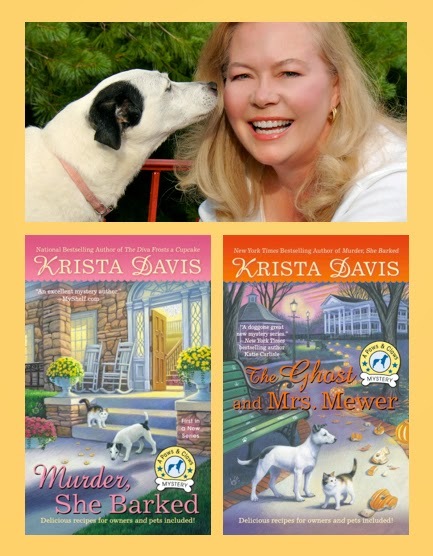 I love both Krista Davis's series, wish I could live in Wagtail! I haven't seen or felt a ghost but Halloween is the great time to enjoy a book about them. Ghosthunters in Wagtail? This should be a really fun mystery. Thanks for the contest. This sounds like a great book and I look forward to reading it. I'm looking forward to reading it and would love to win a copy! Would love to win! Yes, ghosts are real, I have seen one. I loved the first book in this series and can't wait to read this! I have experienced some unexplainable things but I'm not sure there are really ghosts. Thanks fir the opportunity to win. I guess my comment didn't post but I was to a restaurant near hmb,ca that was haunted and didn't see anything but in my foster home years ago I felt the presence of my foster mom that passed a few years before and that gave me the shivers that is for sure as I felt it several times. Would love to read your new book and I would love to post in several sites. I read the first book and loved it. I would love to have the 2nd one. Would love to win a copy! Loved the first book in the series and can't wait for the release of this one. Thanks! I have seen a ghost in my house (a scottish bagpiper), found orbs on my photos and felt a ghost on the Queen Mary in the pool room. oh and my phone usually goes crazy after a ghost tour. Yeah they are real! I have never seen a ghost, but have had things happen to make me believe. I haven't seen a ghost and don't believe in them specifically but I do believe that the spirits of people we have (or sometimes haven't) lost can still come around. I once to lived in a for real haunted house. Saw and heard things I'll never forget. Thank you for a chance to win! I have never believed in ghosts but that doesn't keep me from reading ghost stories or watching scary movies. I would love to wind this ARC. I've always been interested in the paranormal and do believe in ghosts and angels. Love the title! Lorraine at monstercreed@yahoo.com. I love your books. I look forward to the Ghost & Mrs. Mewer. Looks like fun. Loved the first book and can't wait for the second book. Seen apparition twice and I can feel 'something' sometimes ☺. Hope I can win this time. I haven't seen a ghost yet but jave been convinced that I've heard my late favorite cat more than once since she's been gone. O would love to read this,has been on my Kindle wish list for many weeks! Love the title. I've never seen a ghost, but I've felt like someone, human or cat, was close by. Okay, this is almost too weird. My husband was just telling me today he had the hair on his arms stand up. We have a ghost. Not a mean one at all. Probably a loved one. I have smelled cigarette smoke when no one is the house, he has hard footsteps on the stairs, see things out of the corner of your eye, etc. Agan, we're not scared. When I was very little, about 6 years old, I saw a figure by our Christmas tree, which was about 2 weeks after our dad died. So I'm almost hoping it is him with us here. So yes, I do believe, but it's sometimes a nice visit. Cool! Just in time for Halloween, a ghost story. Love it! Not sure if I believe in ghosts but I do believe in good and bad energy in places. I live in an old house that I think had happy spirits in it. I am not sure if ghosts are real or not. I have never seen one so who knows? Thanks for the chance to win your book. I have never seen a ghost, but have felt that someone whom I loved and has passed is near me. Also, am looking forward to reading this book! I have always had ghosts around me, we lost 12 people in our family in 8 years when I was a child. Many of them appear to me over the years in a ghost form and others I have one that lives in my back seat and watches over my safety when I am in the car, several that come and go in my home. They are all very welcome and I tell them they are welcome as long as they are nice. I do a welcome good spirits cleanse in my home and have always had the most peaceful loving home feeling with them here. I adore this series, looking forward to the new release with great anticipation. seascapelife@gmail.com thanks for the opportunity. I already have the Ghost and Mrs. Mewer pre ordered and can not wait to read it. I will, however wait until next Fall to dig in, but I know it will be worth the wait. I am a fan of your Domestic Diva Mysteries and always look forward to another book, so I knew I would enjoy this new series. Congratulations, Krista for the great new series and I am so happy the series are so different from each other. Great job, keep them comming and happy writing. HAPPY HALLOWEEN!